CASE and leading by convening! As you are receiving this email this Monday morning, I am in Alexandria, Va., representing CASE and you in a group of "Activity Leaders" for the IDEA Partnership as we finalize the plans for the annual IDEA Partnership Winter Meeting. President Laurie VanderPloeg will be joining me along with Dr. Gina Scala (PA), CASE Research Chair as they participate in specific areas of the meeting. Two other former CASE presidents are also Activity Leaders, Pat Guthrie (KY) and Dr. Christy Chambers (IL). Every IDEA Partnership meeting is important and at the same time an amazing opportunity. CASE has been involved in the Partnership from the very beginning and have often featured Partnership initiatives especially at what used to be our Winter Institute. And in fact, the second day of this year's CASE Hybrid conference will be all about partnership and how working together has made a huge difference in the assessment area. Dr. Joanne Cashman, Director of the IDEA Partnership will be moderating the day and has put together an amazing team! But THIS January Partnership meeting is going to be truly transformational! So much of the Partnership work has been called transformational and has truly been but finally we have been able to not only define this work but actually put in written form a "Blueprint" for replicating this work. A blueprint does not tell you every detail but it does tell you the major, crucial details — like where to put the weight bearing walls. This document will help groups make systemic changes that will make amazing impact on the way we do things for students, families, districts and our community from local to state to national! The meeting will be a combination of demonstrations of states who have made this transformation by leading by convening to providing the tools and steps for anyone to take the lessons learned and move forward! If you want to get an inside look at what is happening at the meeting, follow the IDEA Partnership @_partnership and CASE @casecec Twitter feeds. There will be "social reporters" during the meeting reporting on the sessions. The meeting will be occurring Monday night Jan. 13-Wednesday, Jan. 15. If you have not visited the IDEA Partnership website, you are missing a great source of wonderful resources! Watch for more information on the IDEA Partnership Leading by Convening document in future CASE updates and on the CASE Facebook page! 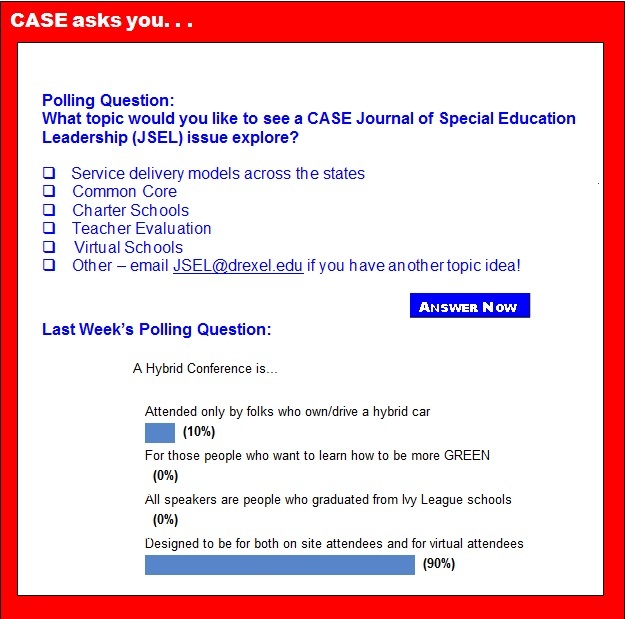 Speaking of Leading by Convening, if you are going to be a virtual site for the CASE Hybrid Conference, we will be sending you the Blueprint links so you can use this professional development opportunity to LEAD by Convening! If you have not registered for the Hybrid Conference, we hope you will seriously consider doing so, either to attend in person in SUNNY Orlando, Fla., at the Rosen Plaza hotel or to be a virtual site. We believe you need to hear what our speakers have to say so you will be better prepared to Keep Up In Changing Times! CEC is pleased to offer the Policy Insider as a regularly updated blog, a complement to the weekly digest you've come to rely on for the latest in special and gifted education policy news. The CEC Policy Insider digest, which comes via email every Wednesday, will be a round-up of stories from the blog, where you can always find news in its entirety. The U.S. Department of Education and U.S. Department of Justice released the first-ever significant guidance document on school discipline to help schools meet their legal obligations. the U.S. Department of Education announced five winners for its Race to the Top-District Competition: Clarendon County School District Two (consortium of four rural districts), South Carolina, Clarksdale Municipal School District, Mississippi, Houston Independent School District, Texas, Kentucky Valley Educational Cooperative (consortium of 18 rural districts), and Springdale School District, Arkansas. This program provides nearly $120 million to support locally developed plans to improve student learning, increase student success and strengthen educator effectiveness. The U.S. Department of Education has recently released a series of ready-made presentations on several focus areas in education, including early learning, K-12 education, teachers and leaders, standards and assessments, and more! Students with disabilities are much more likely than other kids to be restrained or secluded at school, but how often the techniques are used varies significantly, a new report finds. Wealthier, less diverse schools employ the tactics more than twice as often as high-poverty, high-diversity school districts, according to an analysis of federal data conducted by researchers at the University of New Hampshire. Nationwide, there were 2.6 cases of restraint for every 100 students with disabilities during the 2009-2010 school year compared to 0.1 instances for every 100 typically-developing students, researchers found. Seclusion followed similar patterns. It's common for kids with ADHD to feel bad about themselves. ADHD creates challenges in all areas of their lives, from home to school. It also doesn't help that they often get negative feedback from all sides. Parents scold them for acting out. Teachers reprimand them for not turning in their homework. Peers tease them if they don't fit in. In this article by Zoccolotti, De Luca, Lami et al, published in Child Neuropsychology, Rapid Automized Naming tests were conducted on 43 average children and 25 with developmental dyslexia. The task involved naming colors, digits, pictures words and word lists displayed multiple times and in discrete form. Participants' response times and error rates were recorded. Dyslexic children not only have trouble identifying strings of letters, but also programming eye movements and synchronizing speech output. Thus reading is a multiple component task presenting difficulty for dyslexic children. During the article the authors outline the results of the tests and analyze reasons for the differences between the two groups. Big questions loom about just how much money Congress will steer to individual programs — including the Obama administration's marquee competitive-grant initiatives — with lawmakers on House and Senate appropriations committees facing a Jan. 15 deadline to fill in details on the current year's spending plan or face another government shutdown. School districts that have been chafing under across-the-board federal cuts known as sequestration for nearly a year got a two-year reprieve under the agreement approved last month that effectively scales back the sequestration cuts to education by 87 percent over that period, according to an analysis by the Committee for Education Funding, a lobbying coalition in Washington. Iowa rules proposed to improve early grade reading should require schools to identify and help students with dyslexia. a group of parents said. More than a dozen members of Decoding Dyslexia Iowa told representatives from the Iowa Department of Education on Friday that teachers don't receive adequate training on the learning disability, a condition that makes it difficult for a child to read, write and spell. Many children with attention-deficit hyperactivity disorder may have missed out on valuable counseling because of a widely touted study that concluded stimulants such as Ritalin or Adderall were more effective for treating the disorder than medication plus behavioral therapies, experts say. That 20-year-old study, funded with $11 million from the U.S. National Institute of Mental Health, concluded that the medications outperformed a combination of stimulants plus skills-training therapy or therapy alone as a long-term treatment. 2013 was a tough time to eke out any news on special education at the federal level. Sure, there were the effects of the sequester cuts (and the prospect that those cuts may soon be alleviated), but Washington was not where special educators were looking in the past 12 months. Instead, they were intensely interested in any news relating to the Common Core State Standards, judging by a look at the most-read blog entries for On Special Educaton Blog in 2013. A post noting that the Partnership for the Assessment of Readiness for College and Careers, one of the test-writing consortia, was seeking comment on proposed accommodations drew high readership, as did follow-up blog posts noting that PARCC had released a proposed accommodations and accessibility manual for students with disabilities, and that the organization adopted a final version of the manual in June. An aspiring clarinetist begins by getting a sense of the way the instrument's sounds are produced by the air she blows through it. A driver must be acquainted with various vehicle fundamentals, such as adding gas, accelerating, and reading the speedometer. It is no different with the brain. Maximizing your brain's health and performance begins with a basic understanding of how it works and how it evolves across the lifespan.